Considered one of the top acoustic blues guitarists on the West Coast, Terry Robb is also an inventive and ever-evolving American primitive master. 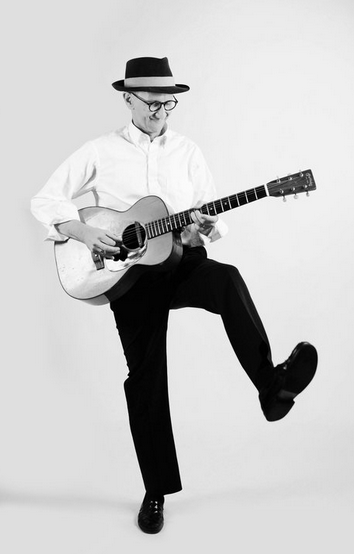 As an heir to the late, great John Faheys musical legacy, Robb is an established icon in a pantheon that includes Robbie Basho, Leo Kottke, Peter Lang, and John Renbourn. He has distinguished himself by redefining this complex finger-picking style, using popular and traditional genres to make this approach accessible to the music-loving public. Robb is that rare talent, a musicians musician and an enormously popular performer. Onstage, his fleet fingers, wry humor, and intense focus mesmerize audiences. The passionate artistry of a Terry Robb event  whether a solo acoustic performance or a high-energy show with his band  often leaves new and longtime fans with mouths agape. With the release in 2005 of his critically-acclaimed solo album, Resting Place, recorded for Memphis renowned Yellow Dog Records label at Sam Phillips Studios by master engineer Roland Janes, Robb has increasingly gained national attention. In his music-savvy hometown of Portland, Oregon, Robb is a celebrity in high demand as a performing and studio guitarist, and as a bandleader, composer, arranger, producer, and teacher. Robb began his career in Portland as a hot-shot guitar-slinger who could play any style of music. At an early age, he immersed himself in all the blues, ragtime, folk, jazz, and country music he could lay his fingers on. In college, he studied music theory with the Czechoslovakian modern classical composer Tomas Svoboda; but once classes ended, Robb hit the road with Frank Zappa/Captain Beefheart alumnus Ramblin Rex Jakabosky, who taught him new theories: the ropes of the Northwest club scene. In the early 1980s, he struck up a friendship with the legendary Fahey, who soon asked Robb to play on and produce several of his recordings, including the extraordinary Let Go, cited by Kurt Loder of Rolling Stone as one of the top three releases of 1983  right alongside Princes Purple Rain and Bruce Springsteens Born in the U.S.A. Throughout the decade, Robb and Fahey collaborated on several albums, including Time God Casualty and Old Girlfriends and Other Horrible Memories. The 1990s found Robb focusing on his own career and collaborating with fellow Oregonian Curtis Salgado on Hit It and Quit It. During this time Robb embarked on a series of national tours with stellar musicians including Buddy Guy and rocker Steve Miller. During this time he recorded both acoustic (Heart Made of Steel and When I Play My Blues Guitar rank as two of his best) and stinging electric blues albums. Terry is one of the top acoustic blues guitarists of our time. His signature fingerpicking style has earned him international acclaim from worldwide audiences, music critics and his distinguished peers. Incorporating elements from the Mississippi Delta music tradition, ragtime, country, swing and free jazz, Robb has built a unique blues sound that has made him a legend in his prolific music career spanning more than four decades.